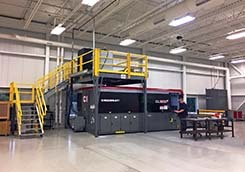 Recently, we completed installation of a new Cincinnati CL900 fiber laser cutter with positioning accuracy of +/-0.001” and a 5’x10’ cutting area. This adds to our existing portfolio of modified tube cutting lasers and completely custom flat sheet cutting lasers. 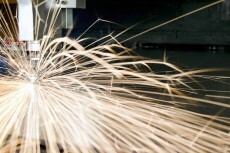 Laser Cutting - Laser cutting is a critical process needed for the manufacture of complex surgical device components. Cadence’s approach to laser cutting is one that involves customization of the standard available equipment offering to optimize the capability for surgical devices. This means our laser cutting equipment has been customized for higher precision motion control versus of the shelf equipment. It also means that the specific material handling capability for feeding specialized materials for laser cutting have also been customized, such as automated coil feeding of flat stock and autoloading of tubing materials. Our next generation CNC laser cutting capability is in place via our 4-axis tube cutting powered by a fiber laser. We provide process development assistance for color marking, as well as light to very dark marks across a variety of materials. We also develop and test for passive marking on certain applications. Laser Marking - Laser marking is a critical process needed for the manufacture of complex surgical device components. This technology enables the laser marking to be done in the same cycle as the cutting and welding of many products. Is optimized for improved image resolution versus of the shelf equipment. Uses customized material handling for feeding sharps. Enables the laser marking to be done in the same cycle as the laser cutting and laser welding on many products. In addition to custom laser welding machines for production jobs, Cadence's Advanced Welding LabTM is dedicated to process development and rapid prototyping. We are also currently building a new station in the lab to test cutting-edge laser welding optics for future equipment. Our Advanced Welding LabTM provides endless possibilities for all of your most advanced welding needs. 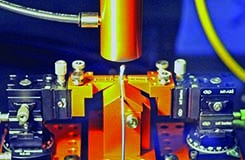 For critical components laser welded to complex sub-assemblies, contact us today!